Kicker’s Korner: Inside the Huddle | The Gettysburgian. “It’s a great day to be a Bullet,” is what Gettysburg Head Football Coach Barry Streeter would say to summarize the team’s 22-15 nail-biting home opener win against the Ursinus Bears. With both teams coming off of week one wins, the stage was set for a great matchup of two Centennial Conference powerhouses. With the Bullets coming into the game having the second highest rushing offense in the nation for Division III, Gettysburg was looking to continue its offensive success that they experienced with their 49-10 win against Bridgewater the previous week. Ursinus was no stranger to close games, with the Bears narrowly beating Millersville University in a 5/OT win. With kickoff set for 1 p.m., fans started to find their way to Shirk Field at Musselman Stadium (which is celebrating its 50th season), but a weather delay set the game back for over an hour. With rain continuous throughout the entire game, the Gettysburg offense got off to a slow start and could not find the same rhythm in the ground or passing game that proved so successful against Bridgewater. Ursinus made the first marks on the board with an Eric Boyer, senior kicker, 43 yard opening drive field goal. Gettysburg gave up a safety on a high snap during a punting attempt inside their own 10 yard line. Another Boyer 32 yard field goal gave the Bears an 8-0 lead over the Bullets to start the second quarter. Despite the offense’s struggles to gain some traction in the first half the Bullets Defense stepped up big and contained the Bears to only 59 yards and forced a punt on their next six possessions. Senior linebacker Kodie McNamara joined the Gettysburg record book, becoming the ninth Bullet to make over 300 career tackles. 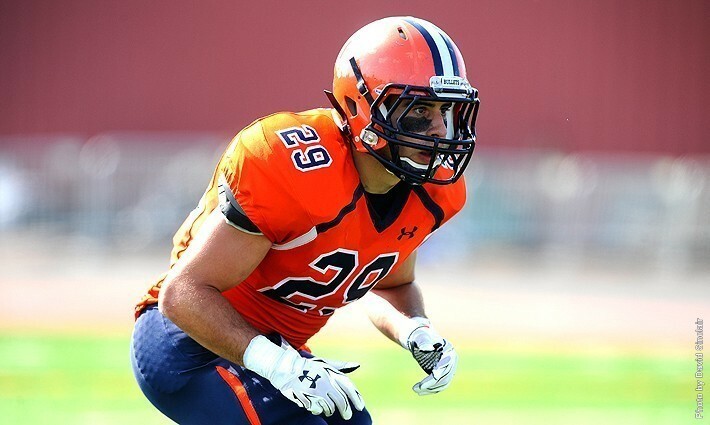 McNanmara also reached a career high 20 tackles against Ursinus. Towards the end of the second quarter Gettysburg senior quarterback and captain Sam McDermott found his groove and connected with senior Travis Andrews for a 33 yard touchdown reception. The Bullets came out firing in every chamber to start the second half, with an 85 yard touchdown drive via a McDermott 2 yard touchdown pass, topped by a successful 2 point conversion to give the Bullets a 14-8 lead in the 3rd. With the defense continuing to make important stops, the Bullets were able to find the end zone again before the end of the 3rd, with sophomore Ryan Thompson’s second touchdown reception of the game from a McDermott pass. Ursinus came back in the early 4th with Corey Lanza running his way to the end zone to make the game a close 22-15 with time winding down. Gettysburg once again found their way into scoring territory with less than two minutes to play, but a failed pitch resulted in a fumble and gave the Bears the ball back on their own 30 yard line with 1:36 to go. On the very next play, senior defensiveback Brian Calatozzo sealed the game with a clutch interception to dash the hopes of late comeback for the Ursinus Bears. With a great team effort, the Bullets danced their way to 2-0 for the season and look to travel to Juniata September 19th to knock off the Eagles (1-1). The Centennial Conference recognized QB Sam McDermott as the Conference Offensive Player of the Week and senior kicker/punter Robby Fay as Special Teams Player of the Week. On a side note the Bullets JV squad, routed Dickinson in 14-0 shutout, highlighted by yours truly converting his first extra point of the season. With the impressive play so far in the season, it appears it will be a great year to be a Bullet!